Infographics on Chopping Block: Google to Penalize Embedded Links? I don't personally use infographics often explicitly as a linkbuilding tactic. Instead I use infographics as a content enhancement tactic, and if someone decides to link to my resource articles via infographics or because of them, then I am grateful that my content has exceeded someones expectations and they felt it was a great resource to share with others. But purely as "link bait?" It's never been a part of my personal strategy. But all the more power to those for whom it has been. Infographics are all the rage right now, and I can see why. They deliver complicated information in a concise, clear way. Infographics take otherwise long, complicated text and make it visually appealing. Web users desire graphics and visuals. Readers feel it enhances the content they're consuming. Infographics make sense in an increasingly visual social world - Facebook and Pinterest thumbnails for example. Despite the occasional weak or downright false infographic, on the whole I feel that infographics are a good thing. They make information more digestible on the web, they're a good branding tool, a new way to provide great content to web users, and of course they give graphic designers a new avenue to display their creative prowess in an increasingly visual web space. However in July, Matt Cutts, the head of Google's Webspam team, alluded to the possible devaluing of infographic links in the future. “In principle, there’s nothing wrong with the concept of an infographic,” Cutts told Eric Enge, president of Stone Template Consulting at SMX Advanced. “What concerns me is the types of things that people are doing with them. They get far off topic, or the fact checking is really poor. The infographic may be neat, but if the information it’s based on is simply wrong, then it’s misleading people." Cutts makes a good point, but there are tons of non-infographic information delivery methods that are off-subject and false, too. Like text. If this is the sole argument against infographics then it seems asinine. Google's algorithm doesn't de-value content based on whether its facts are accurate or not - there is all sorts of false information all over the web. "Fact checker" is not the search engine's job. Instead, they deliver results based on how relevant they are to the searcher's query. Why should infographics be any different? I think that most publishers are trying to make an honest living and do their best to produce high-quality, accurate content. He also told Enge, "The other thing that happens is that people don’t always realize what they are linking to when they reprint these infographics. Often the link goes to a completely unrelated site, and one that they don’t mean to endorse. Conceptually, what happens is they really buy into publishing the infographic, and agree to include the link, but they don’t actually care about what it links to. From our perspective this is not what a link is meant to be. ... I would not be surprised if at some point in the future we did not start to discount these infographic-type links to a degree. The link is often embedded in the infographic in a way that people don’t realize, vs. a true endorsement of your site." Ok, the argument is that people who embed infographics on their websites may not be aware that links are embedded in the code, or of where they're pointing. Fair enough. But I'm willing to bet that far more people who embed them do know than those who don't, because if they're savvy enough to embed an infographic in their website, they're probably savvy enough to tell if the infographic came from that publisher or not. Whose responsibility is it to do the due diligence before uploading content to their own website? Perhaps they're simply being courteous and crediting the original content provider and copyright owner for the valuable resource by way of a link - how does Google intend to distinguish between spammy infographic links and legitimate credit to the copyright owner? Should good faith producers of infographics really be punished because of the actions of the occasional shady black-hat? At the end of the day, Google is going to do what it wants to do with their algorithm, no matter how unfair we feel that change my be - and it's their right to do so. But I hope at the very least if they decide to go this route they merely devalue and not penalize these backlinks, and I hope they don't devalue them completely. I also hope they put some serious thought into the implications of this kind of change for innocent, well-meaning web content publishers. Anything, anywhere, anytime can be abused, and I support Google's persistent drive to improve the quality of content on the web (even if I don't always agree with the moves they make to achieve that end), but I'm just not convinced that this is the best way to avoid infographic abuse. In the meantime, Cutts did provide a few tips on how to do infographics safely and successfully, and I added a few of my own assumptions as well. I think these should come as no surprise to any ethical, well-meaning SEO. Use great, unique, compelling data. All infographics should be relevant and interesting. Check your facts and credit your sources in the infographics. Ensure your embed code hyperlinks to a relevant, appropriate web page. Beware of hyper-optimized link title text, anchor text, etc. in the embed code. Make them great-looking pieces of graphic design work. 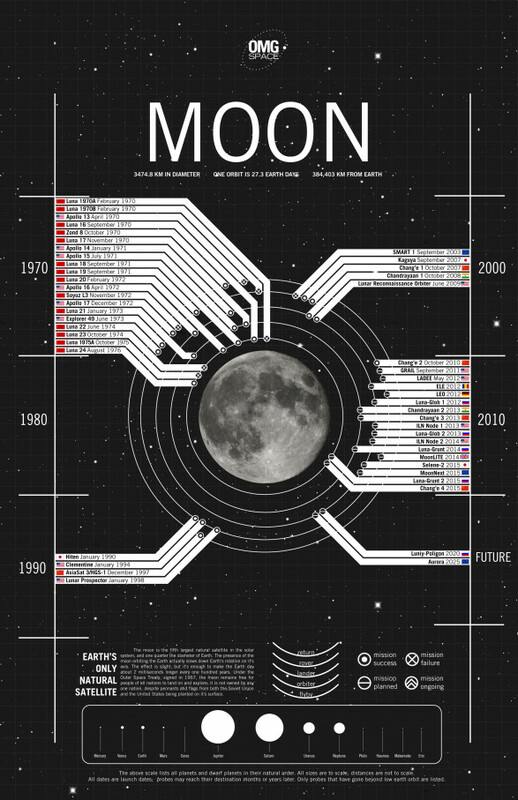 And with that, I leave you with this sweet infographic about the moon.